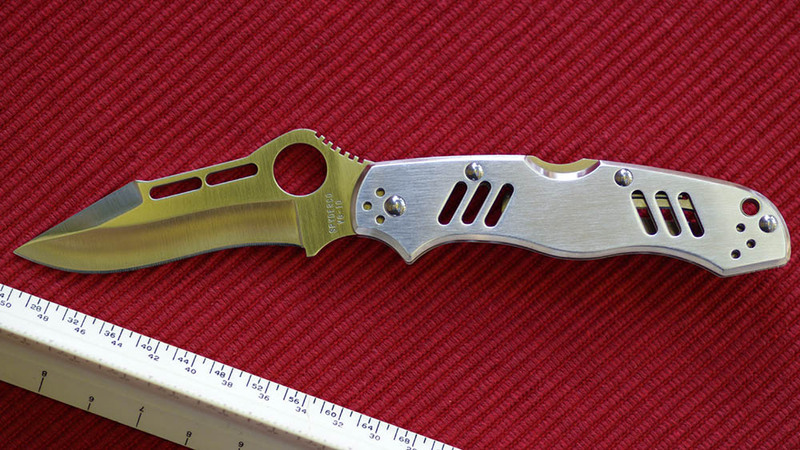 The C102 Adventura was the first knife designed by a Spyderco forum member. "The concept of the Adventura folder came from Romanian Technical Manager Alexandru Diaconescu. In keeping with his methodological background, the folder is techie, futuristic and fastidiously engineered to combine function with a cool factor. The PlainEdge VG-10 blade is hollow-ground with an unsharpened swedge-grind. Oblong slots cut through the blade and handle diminish weight and allow a glimpse of the knife’s internal components and locking mechanism. The fully stainless handle is a composition of swells and angles inviting your hand to wrap around and grip in comfort. Both the back-lock and Spyderco Round Hole are positioned to facilitate easy single hand deployment and jimping on the blade’s crown keeps your thumb in controlled contact. For added lock safety, a David Boye Dent is carved from the locking lever and eliminates accidentally releasing the lock if gripping the folder tightly. A four-way: left/right, tip-up/tip-down pocket clip attaches via three steel screws and has a rounded, tapered end that stops wear and tear on a pant’s pocket." The C102 Adventura was made in Seki-City Japan. This page was last modified on 19 October 2013, at 02:36.